Yankee Group has sold 4G World, the world’s largest event covering 4G technology, to UBM TechWeb, the global leader in tech media and information. 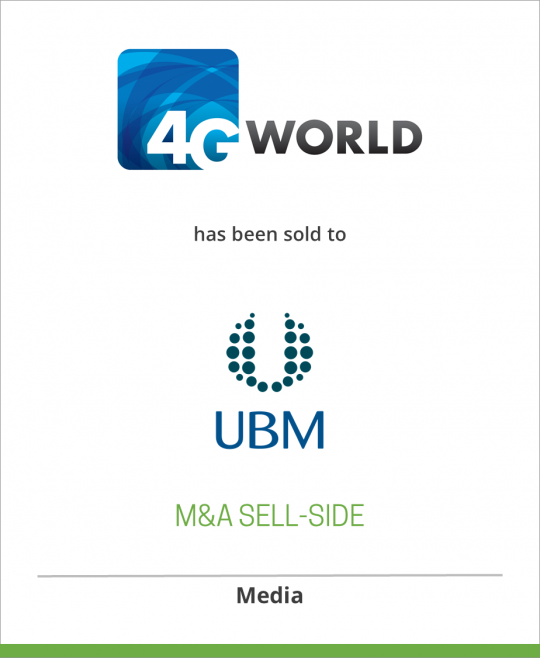 DeSilva+Phillips client, Yankee Group, has sold 4G World, to UBM TechWeb. 4G World is the largest event in the world covering the entire ecosystem of 4G technologies and business models that power the mobile Internet industry and economy. The massive growth in the 4G marketplace – predicted to grow to 2.5 billion subscribers in 2016 according to Pyramid Research – fuels the demand for a conference and expo to bring key stakeholders together to discuss, debate and evaluate the most important 4G topics, opportunities and solutions. 4G World is happening Oct. 29 – Nov. 1, 2012 at McCormick Place in Chicago. For more information, visit http://www.4gworld.com/. Heading up the 4G World program will be Berge Ayvazian, the founding Conference Chair for 4G World and before that, WiMAX World. Ayvazian is currently Senior Analyst with UBM TechWeb’s Heavy Reading where he manages the research company’s 4G Consulting Business and has spent 30 spent years covering and advising the global communications market, including serving as former CEO of Yankee Group. 4G World 2011 attracted over 8,500 registered attendees and featured over 250 sponsors and exhibitors, over 80 interactive sessions featuring 20 speakers and 30 mobile operator case studies, an Expo show floor, rich networking opportunities, and an awards ceremony. Follow 4G World on Twitter @4GWorld become a fan of 4G World on Facebook or join 4G World on LinkedIn. Yankee Group is the preeminent research and advisory firm equipping enterprises to profit in a mobile world. The core of our content is proprietary research and analytics on the attitudes, behaviors and usage patterns of mobile users. Based on this research, we provide a range of actionable data, insights and advice to marketing, strategy and product executives driving the mobility revolution in leading companies worldwide. UBM TechWeb, the global leader in technology media and professional information, enables people and organizations to harness the transformative power of technology. Through its three core businesses – media solutions, marketing services and paid content – UBM TechWeb produces the most respected and consumed brands and media applications in the technology market. More than 14.5 million business and technology professionals (CIOs and IT managers, Web & Digital professionals, Software Developers, Government decision makers, and Telecom providers) actively engage in UBM TechWeb’s communities and information resources monthly. UBM TechWeb brands include: global face-to-face events such as Interop, Web 2.0, Black Hat and Enterprise Connect; award-winning online resources such as InformationWeek, Light Reading, and Network Computing; and market-leading magazines InformationWeek, Wall Street & Technology, and Advanced Trading. UBM TechWeb is a UBM plc company, a global provider of news distribution and specialist information services with a market capitalization of more than $2.5 billion.